The San Francisco 49ers were trying to remain in contention in the NFC West as they faced the Minnesota Vikings on November 29, 1976. Under the guidance of Head Coach Monte Clark, the 49ers had gotten off to a 6-1 start before dropping four straight games, and were now 6-5. To make matters worse, starting QB Jim Plunkett, an offseason acquisition from the Patriots, was injured and untested rookie QB Scott Bull, a sixth-round draft choice out of Arkansas, would have to start in his place. They did have a reliable ground game with HB Delvin Williams (pictured above) and FB Wilbur Jackson, and would be even more dependent upon them. Minnesota was coached by Bud Grant for the tenth year and was used to contending, having topped the NFC Central in each of the last three seasons. The Vikings were 9-1-1 as they came to San Francisco. 36-year-old QB Fran Tarkenton was still one of the league’s best and the receiving corps was bolstered by the addition of wide receivers Ahmad Rashad, formerly with Buffalo, and rookie Sammy White. 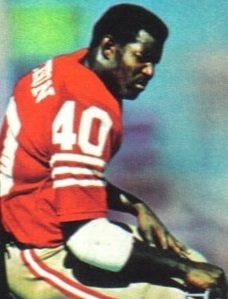 HB Chuck Foreman was outstanding both running the ball and catching it out of the backfield. The defense had been the team’s bedrock over the years and, while age was becoming a factor, it was still a tough unit. There were 56,775 fans in attendance at Candlestick Park on a cool, clear Monday evening. The Vikings had the game’s first possession and punted. With Wilbur Jackson and Delvin Williams running effectively, the 49ers advanced 51 yards in eight plays. Jackson finished the drive off with a two-yard touchdown carry, Steve Mike-Mayer added the extra point, and San Francisco had the early 7-0 lead. The Vikings responded with a promising drive that was fueled by the running of Chuck Foreman, who gained 27 yards on the first three plays. However, the visitors came up empty when the series stalled at the San Francisco 34 and Fred Cox was short on a 51-yard field goal attempt. Jackson (pictured below) carried five times for 21 yards and Williams had a 30-yard run as the Niners drove to the Minnesota eight, but they failed to add to their lead when Mike-Mayer hit the right upright on a 25-yard field goal try. As the game headed into the second quarter, the Vikings had to punt and this time the 49ers didn’t come up empty. Jackson had a 24-yard run to advance the ball into Minnesota territory and Scott Bull threw to WR Jim Lash, an ex-Viking, for 10 yards. Bull was sacked for a ten-yard loss on third down, but Mike-Mayer was successful on a field goal from 45 yards and San Francisco was ahead by 10-0. The Vikings put together a long drive of 85 yards in 17 plays. Facing a third-and-11 situation from their own 14, Fran Tarkenton threw to Ahmad Rashad for a 33-yard gain and a third-and-six play from the San Francisco 36 resulted in a Tarkenton completion to Foreman for nine yards. A pass interference penalty allowed Minnesota to convert another third down and the final play of the series resulted in a Tarkenton toss to Sammy White in the end zone for a 17-yard TD. Cox converted to make it a three-point game at 10-7. The 49ers had to punt from deep in their own territory and the Vikings needed just five plays this time to score again. Tarkenton threw to Rashad for a 47-yard pickup and, two plays later, it was Tarkenton-to-Rashad once more for an eight-yard touchdown. DT Cleveland Elam blocked the extra point attempt but the visitors were ahead by 13-10 with 2:24 remaining in the first half. San Francisco responded by advancing 83 yards in seven plays. Williams started the series off with a 23-yard run and, just after the two-minute warning, Bull completed a pass to WR Gene Washington for 16 more yards. A pass interference call on CB Nate Wright placed the ball on the Minnesota one, and Bull dove into the end zone from there for a TD. Mike-Mayer converted and the 49ers were back in front by 17-13 at halftime. The 49ers had the ball first in the third quarter but FS Paul Krause intercepted a Bull pass and that resulted in Cox kicking a 37-yard field goal that narrowed the score to 17-16. Once again it was Jackson and Williams carrying the load as the Niners kept the ball on the ground, but the drive stalled at the Minnesota 30 and Mike-Mayer was short on a 47-yard try for a field goal. The teams exchanged punts for the remainder of the period, but the 49ers were winning the field position battle and had advanced to the Minnesota 25 as the contest entered the fourth quarter. Mike-Mayer booted a 38-yard field goal early in the final period and San Francisco was up by four points. The Vikings punted following their next series and, on the second play of the ensuing possession, Williams took off on a 26-yard run that put him over a thousand yards for the season. However, he also had to leave the game with a sprained ankle, hobbling off the field to a loud ovation from the crowd. The teams returned to exchanging punts and now it was Minnesota benefiting from the exchanges. A 44-yard kick by Neil Clabo had the 49ers pinned back at their five yard line with 9:38 remaining to play. The Niners went three-and-out and punted, giving the Vikings possession at the San Francisco 24 following a 14-yard return by DB Autry Beamon. Foreman ran the ball three straight times and, after LB Skip Vanderbundt stopped him short of a first down on a three-yard carry, the Vikings faced fourth-and-one at the 15. Foreman carried once more, and this time it was LB Dave Washington stopping him for no gain. The 49ers were unable to maintain control of the ball as Bull’s six-yard run on third down came up inches short of a first down and forced a punt. Minnesota still had 1:19 to work with after taking over at the San Francisco 47. On second down, following an incomplete pass, Tarkenton was penalized for intentional grounding in order to avoid being sacked for a sizeable loss. As it was, it cost the Vikings 15 yards and a down, and a completion to Rashad for seven yards had them facing fourth-and-18. Tarkenton threw to WR Bob Grim for a gain of 27 yards to keep the series alive, but two passes into the end zone fell incomplete as time ran out. The 49ers held on to win by a final score of 20-16. San Francisco had the edge in total yards (331 to 282), with 317 on the ground, and first downs (17 to 16). The 49ers also were credited with three sacks, to two for Minnesota, although they also suffered the game’s only turnover and drew more penalties (9 to 8). Both teams had problems with placekicking as Minnesota’s Fred Cox missed an extra point as well as a field goal attempt and Steve Mike-Mayer failed on two of four field goal tries. Wilbur Jackson and Delvin Williams both gained over 150 rushing yards, with Jackson accumulating 156 on 30 carries that included a touchdown and Williams compiling 153 yards on 20 attempts despite being knocked out of the game with an injury during the fourth quarter. Scott Bull went to the air only eight times and completed three for 32 yards with one interception. Three receivers had a catch apiece for the 49ers, with Gene Washington gaining a team-leading 16 yards on his reception. 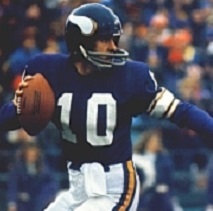 For the Vikings, Fran Tarkenton (pictured at right) completed 16 of 37 passes for 200 yards and two touchdowns while giving up no interceptions. Ahmad Rashad had 6 receptions for 103 yards and a TD. 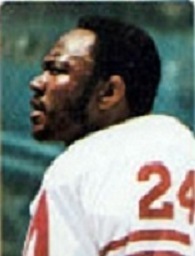 Chuck Foreman rushed for 93 yards on 23 carries and gained another 23 yards on three catches. The 49ers split their last two games of the season with Scott Bull at quarterback and finished with an 8-6 record that was good for second place in the AFC West but not good enough to qualify for the postseason. Minnesota recovered to win its last two games to once more top the NFC Central at 11-2-1 and advanced to the Super Bowl before losing to the Oakland Raiders. Delvin Williams broke Joe Perry’s 22-year-old franchise rushing record with 1203 yards on 248 carries (4.9 avg.) and scored seven touchdowns. He was selected to the Pro Bowl. Wilbur Jackson gained 792 yards on 200 attempts (4.0 avg.) with one TD. Scott Bull ended up completing 21 of 48 passes for 252 yards (43.8 %) with two touchdowns and four interceptions. He also rushed for 66 yards and two TDs.